It was an era of post-media explosion, the 80s saw the rise of comics and cartoons in ways that made everyone want to jump in, and jump in they did, leading to the 90s implosion that we all now know as a very dark time in comics history. Having read plenty of comics from that era, they’re generally everywhere for just a few dollars, it’s easy to generalize comics from the 90s as being collectively bad. It was an era of pouches, “edgy” themes, bad art, style over substance and there was also a significant focus on making sure everything looked futuristic. Cartoons were just about the same. With the world finally watching, creators were trying to make history, and one such Dan Jurgens was responsible for one of the biggest stunts in all of comic history in 1992 when he killed Superman in Superman #75 and ended up becoming a big name in the industry thanks to it. His chance at making history didn’t stop there, as he then turned his sights to a comic book legacy that dominated majority of the 80s under the pens of Marv Wolfman and George Perez: the Teen Titans! For 24 issues, and several tie-in one-shots, Jurgens attempted to put his stamp on Titans history. For two years he controlled this relatively small and now forgotten era, and though he attempted to go big or go home there must be some reason why everyone remembers Wolfman’s era which came before, or Geoff Johns era which came after and why his still remains on the obscure side. Starting off, it definitely doesn’t help that this series isn’t collected for people to easily read the issues today. In fact, majority of titans comics are in fact not collected. Especially from the late 90s/early 00s era of the team. It also doesn’t help that a certain action cartoon starring these loveable kids aired on Cartoon Network in 2006 and pulled heavily from both Wolfman and John’s eras of the team. Perhaps lending to the forgotten era of Titans. But is Jurgens’ team any good? Were the stories exuberant, however lost in an age people often wish to forget? A gem wishing to breathe life and instead being pulled down by the mediocre storytelling around it? Was this new approach worth two years of the people’s lives who followed it from beginning to end while it was being published? The short answer is not really, but I’ve read far worse. Having recently marathon read the entire 24 issue run (plus the Dark Nemesis tie-in one-shot, and the Annual) I was able to get a proper sense of the scale Jurgens was building towards. Even pulling George Perez to keep on standby as a secondary illustrator for the series. He wanted some brash, something new, a new era of Teen Titans for a new era of reader. Change is tough though, and I fully admire Jurgens for attempting what he did. This wasn’t a team that consisted of Robin, Wonder Girl, Beast Boy or Starfire. It was a team that consisted of four entirely new characters that were created just for this run. All of them half-human, half-alien, to give them a reason to come together yet also remain different enough from their predecessors. And people were not very responsive at first. They wanted THEIR Titans, and that’s fully understandable. But Jurgens was given two years to win people over, and it was certainly a strange adventure he must have been experiencing along the ride. Reading the letters columns in the back, people were at first hesitant to accept these new teenagers, but somewhere in the middle there so many people writing cheering for these guys and gals – to the point to where they were angry when Joto was killed in issue #15. However, as the series was winding down there was plenty of negativity setting in on the series, some people riding Jurgens’ tail for not putting enough analysis on the character and instead sticking to substance. A real problem, which substance over story tends to be. I’m not sure if Jurgens wanted to end his run after 24 issues, or if sales were just beginning to get to low that he had to. But by the end it was apparent the series was dying. 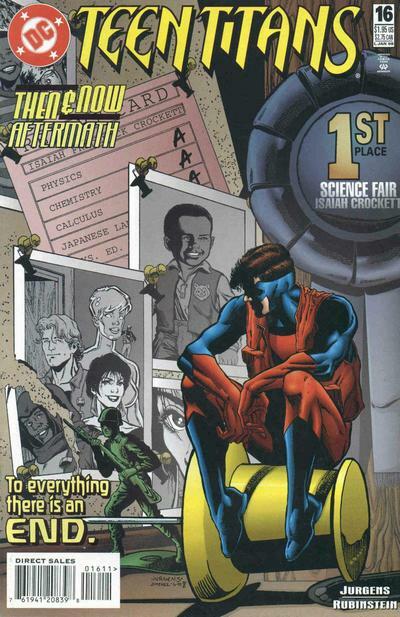 Risk, Joto, Argent, Prysm, and later a few others all led by Ray Palmer – the Atom – after he was de-aged to 17 years old in the DC comics event Zero Hour: Crisis in Time, also by Jurgens. It was a bold move, and made a bold statement that these were not going to be your daddy’s Titans. And they were not, instead of being a fun-loving and bubbly sort of team, they all brash, headstrong, and naïve. These were kids who embodied the 90s as risk-takers first, situation-thinkers second and would choose to fight with style over substance. It got them into a lot of sour spots too, but none of them could ever seem to fully get along. Not even Ray, who constantly reminded these kids and the reader every other panel that he was Justice League and shouldn’t be here, could win me over as the real heart of the group. It was irritating reading all about characters who were constantly down one another’s throats, and even after 2 years worth of storytelling, they didn’t start getting along until the final panels of the final issue. Joto was really the closest the group had to a “heart” no matter how innocent Prysm was to the world around her, yet his focus as the heart came post-mortem. After his death Jugens tried to make us feel for him, giving us an entire epilogue issue to explain in great detail WHY Jotoh was someone worth rooting for. Even if it was already too late for the character himself. Argent later attempted to become both the heart and the drive of the team, really starting to get into the whole Teen Titans that after initially being against it. You could tell she was Jurgens favorite, the”perfect” beauty queen yet filled with spice if she didn’t get her way. If anyone had real, natural growth through this run it was Argent. And even so she had a few lapses towards the end that really just hurt to read. Risk and Prysm had a one-sided romantic subplot that felt a bit unnatural for these two, but was totally rushed in the last issue of the series. Risk was the jock, the troublemaker, the guy all the girls wanted and Prysm was the shy one, the “freak” who looked at him longingly from afar. 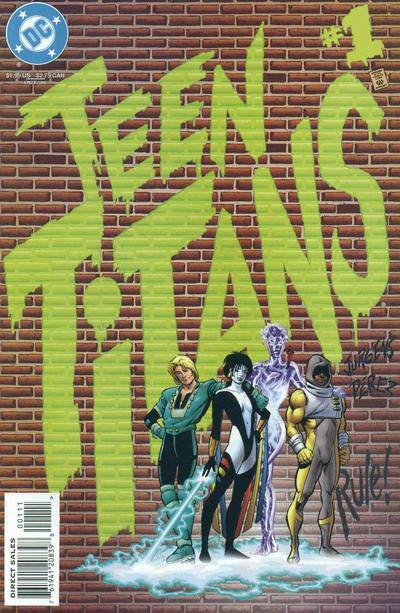 Now that I think about it, this era of Teen Titans was Jurgens version of writing the Breakfast Club. Hell, it fits so well. What brought these characters together was their relation due to an alien race known the H’San Natall, who came and kidnapped their mothers and impregnated them until the day the H’San decided it was time to unleash their “sleeper agents” upon the world. Unfortunately for the H’San, these kids were gotten to quick enough and were unable to fulfill that destiny. There were actually 10 H’San Natall children, and we got to see 6 of them in this run. But two years must not have seemed like enough time for Jurgens to give us all 10, for as of this writing all I can assume is that the final four remain a mystery till this day. That is pretty jarring, because there are so many plot threads that were either undone or rushed to conclusion in the final few issues, but getting to know the final 4 H’san Natall children was just too much for two years worth of storytelling. This era was also heavily bogged down by crossovers and tie-in issues. 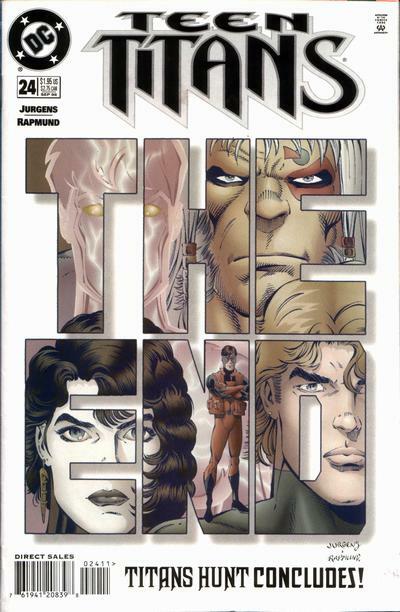 With storylines like Genesis and several side one-shots forever changing the course of events in the main book, and the reader constantly being told to go buy those issues to understand what big changes our heroes were referencing. If something happens in another book that has to do with what I’m reading, I’m very happy to be told where I can go find that information if I’m curious, but there’s just so much here I was confused about why there were more game-changing events happening in side stories rather than in the main book itself. Since character arcs and personalities were thin, and the game changing events were happening elsewhere, what was the reader left with then too much on a month-to-month basis? Well, not much to be honest with you. Well, no, the reader was treated to every possible then relevant pop culture reference Jurgens could think to make. It seemed every other line Risk spat out involved him referencing a different pop culture icon or phenomenon at the time. And with Prysm, who grew up in a virtual 50s era or pop culture at them time (it’s a whole thing), we also got plenty of that as well. I don’t mind pop culture references every now and then, I quite like them in fact, but after five in one issue I start to lose my interest. And then he just kept rolling them out. The storylines had their strong moments and their weak moments, but the revelations each one harbored were never strong enough to live up to expectation. Save for probably finding out that Prysm is a princess for the H’San Natall, I’ll admit that was pretty cool. 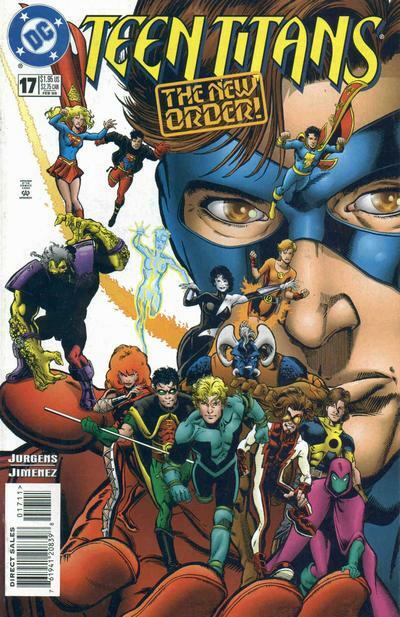 Dan Jurgens era of Teen Titans wasn’t long lived when you think in terms of comics publishing time, a small blip on the radar of comicdom and in the personal history of the Teen Titans. However, with the ginormous ‘Risk’ (see what I did there?) he was taking by introducing such drastically new characters for the team, as well as setting up a pretty interesting back story for each of them, there was no reason it couldn’t have been so much more. Especially when coming from the guy who killed Superman (no matter your thoughts on that overall storyline), and being heavily involved with a fellow who helped shape all we know of the Teen Titans in the 80s. The potential for substance was there always on the tip of Jurgens pen but never quite making it to the page. Unfortunately, style was the order of the month for two years straight. And I guess you could say that’s why this team was forced to fade out of history and our hearts. 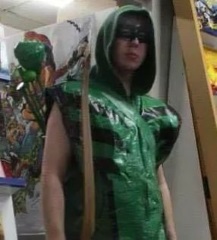 This entry was posted in Comic Book Reviews, DC., teen titans and tagged dan jurgens, DC, teen titans. Bookmark the permalink.